Our black graduation stole with silver trim might be the perfect choice to bring your outfit together just the way you want. Don't wait until it is too late, graduation is closer than you think and here at Honors Graduation we have everything that you are looking for. From your graduation caps and gowns to customized tassel charms, we have exactly what you need and more to look amazing on this important day in your life. Throughout the process of preparing for your graduation reflect on the good times as well as the tough, it is because of your ability to endure that you have reached your goals of graduation. As you gather with friends and loved ones to celebrate your triumphant completion to your schooling be sure to soak it all in and fully enjoy it. It is a common requirement for students who plan on walking at their graduation to wear a graduation cap and gown. You will want to be dressed appropriately as this is a day that you will not soon forget. 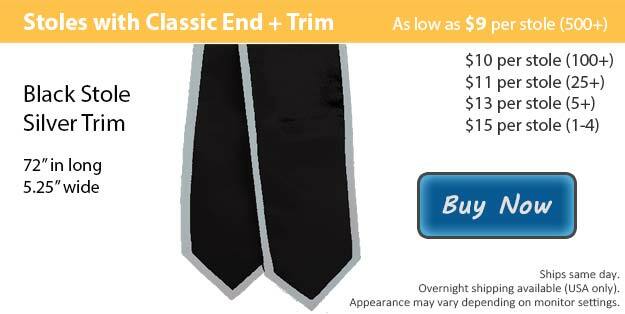 Our graduation stoles are available in multiple styles, there is the classic option or we also have an angled finish. We also have a long list of other color options available as well, allowing you to select the perfect combination to represent yourself during your ceremony. We also offer stole customization for those who wish to add an image or perhaps the name of your association. Our custom stoles are a fantastic way for groups and clubs to stand together during graduation. They are also perfect mementos to put up on display in your home or office for a great reminder of all your hard work and all that you have accomplished. If you prefer a solid, single colored graduation stole, you can purchase them without the trim as well.